Former IPS officer S.R. Darapuri, who was yesterday arrested with eight associates in Lucknow, said that he and his mates were not planning to hold any protest at Chief Minister Yogi Adityanath's residence. Asserting that he only intended to hold a seminar for upliftment of the Dalits, Darapuri said that the Bharatiya Janata Party (BJP) on one hand is vouching for a Dalit President and on the other hand is not allowing Dalits to convene a seminar. "Around four days ago we had booked Press Club and the programme was aimed to deliberate on Dalit atrocities. In this, Dalit activists from Gujarat, Uttar Pradesh were about to participate and around 11:30 when we went to Press Club, we were told that the government officials have cancelled our booking after which suddenly CO, SP city and ADM started questioning us and they asked us how were we convening this meeting without permission, we replied that we were not convening any meeting. they told us that were convening a meeting without permission and told us that we violated section 144," said Darapuri. "I told them that no permission was needed to convene meeting inside the Press Club, but they said that by entering Press Club we already violated section 144. Around eight of us were arrested and later around evening we were freed. We were arrested under 151 and 116 CrPC and were released on bail bond of Rs. 20,000. We were never planning to protest at CM's house. Even in the press note we did not say such thing. Our aim was to hold a seminar, where Dalit activists from outside the state were about to participate," he added. Darapuri also accused the BJP of quashing dissent and said that the saffron party is trying to quell freedom of expression of every individual. "I think the government is not ready to hear any form of dissent and the government is in the mood to crush dissenting voices and the government here is trying to quell freedom of expression of every Individual. Though on the side this BJP government is trying to give us a Dalit President, and on another hand, it doesn't allow any Dalit to hold seminars," he said. 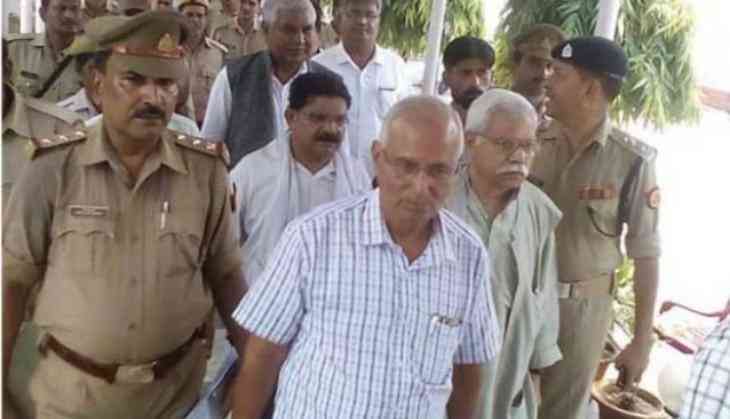 Darapuri and eight others, who were arrested planning to hold a protest against Uttar Pradesh Chief Minister Yogi Adityanath at his residence, were released yesterday evening. "They were going towards Hazratganj where Section 144 was imposed and they also did not have permission to hold a rally," Superintendent of Police (SP) West Lucknow V.C. Tripathi said. According to the police, the ones arrested are associated with the Bundelkhand Dalit Sena. They were to hold agitation protesting various issues prevailing in the state.